Ottawa-Glandorf’s Erin Kaufman was second-team All-Ohio in Division III and the Western Buckeye League Player of the Year this past season. OTTAWA — Erin Kaufman, who is The Lima News basketball Dream Team girls Player of the Year, started out in the corner but ended up at center stage. But over the course of her high school career she evolved into a point guard and a leader. And this season, as a senior, she added leading scorer to the list of things she did for the Titans. “I came in as a shooting guard. My main job was to stand in the corner and chuck up threes. Over the years I kind of grew into the role of it being my job to get other people the ball. I didn’t get up as many shots as I used to, but I definitely distributed the ball a lot more,” Kaufman said. Kaufman averaged 12.8 points a game this season and finished with a career total of 950 points. She was second-team All-Ohio in Division III and the Western Buckeye League Player of the Year. “Every year she was called upon to do more, which is what you want from players who play for four years. She was our offensive Player of the Year and a very good on-ball defender. She really strengthened herself. In our biggest games, she usually stepped up for us,” he said. Kaufman had a career-high 30 points in a 73-46 win over Kenton that clinched a share of a fourth consecutive Western Buckeye League championship for O-G and scored 23 points, with five 3-pointers, in a 59-50 win over Division IV state runner-up Ottoville. 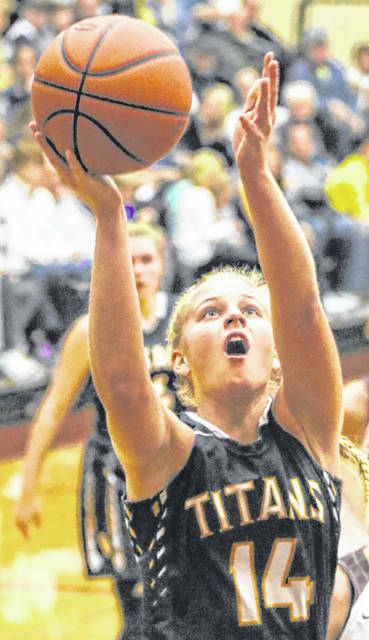 Kaufman and the rest of the Titans knew they would have to take on more responsibility this season with two-time first-team All-Ohio player Kadie Hempfling moving on to Bowling Green State University, where she started every game but one as a freshman. “Obviously, all of us had to step up in all the different aspects because Kadie rebounded the ball, she got the ball up the floor, she got her share of points. She was literally an all-around player,” Kaufman said. Part of her adjustment was to be more of a scorer, but at times old point guard habits were hard to break. “I felt like as a point guard it was kind of my role to get the ball to other people. But then again I needed to realize that if I had a decent shot I should take it,” she said. Yant said, “She was still in that mode that ‘I’m the point guard. When I see somebody open I’ve got to get them the ball.’ As the ultimate team player she probably sacrificed some games we won where she could have gotten another 10 points and been a 1,000-point scorer. “That was never something she really worked for. It was always about the team’s success and what we had to do to win the game in front of us as opposed to her going out and getting points. A lot of times you almost had to encourage her that, ‘Hey, you need to be shooting, you need to be attacking, you need to be taking some shots right now,’ ” he said. Ottawa-Glandorf won 100 of the 109 games Kaufman played and went to the state tournament her freshman, sophomore and junior seasons as part of a four-year streak of going to state from 2015-2018. O-G was 26-3 her freshman season, 27-1 when she was a sophomore and 25-3 when she was a junior. It finished 22-2 this season, which ended in the district championship game in a 55-50 triple-overtime loss to Liberty-Benton. “Going down to state three times was unbelievable and the memories I’ve made with the girls the last three years are unbelievable,” Kaufman said. “The games that stick out are Kettering Alter (an overtime loss in a state semifinal) where we came back from 14 down or so and the Liberty-Benton game this year, which was a really fun one to play in. It didn’t go the way we wanted but it was definitely a game I’ll remember for the rest of my life,” she said. Kaufman will attend the University of Toledo and this year was the end of team basketball for her, but not the end of basketball in her life. “I’m definitely going to be playing still. Hopefully, there’s a practice team or something along those lines because I won’t be able to stay away from the game,” she said. The other members of the girls Dream Team, along with Kaufman, are: Chandler Clark (Bath), Kasey Knippen (Ottoville), Alivia Koenig (Bluffton), Destiny McDonald (Lima Senior), Courtney Prenger (Minster), Rylee Sybert (Columbus Grove), Betty Vorst (Delphos St. John’s), Rosie Williams (Lima Central Catholic) and Ivy Wolf (Minster).